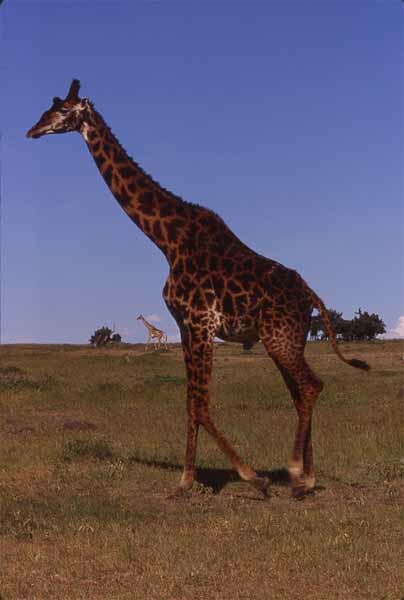 Virtually any child can identify the giraffe (Giraffa camelopardalis), popular in children's picture books, and as cuddly toys. Its popularity is understandable. We all recognize the giraffe as the world's tallest land animal, with their cute looks and funny way of splaying their legs to drink. Giraffes are popular exhibits at zoos all over the world. 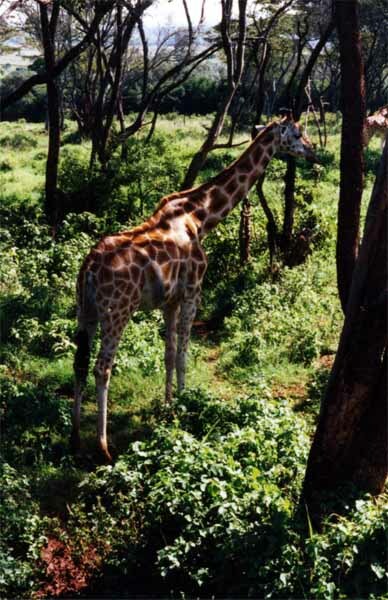 This bull giraffe was photographed in the Mara National Reserve in Kenya, among a small herd of about fifteen (note the individual in the background). This baby giraffe was photographed roaming among some trees at a private reserve near Nairobi, Kenya. Note how well the giraffe's coloration fits in with the backgroundexcellent camouflage if a predator is lurking nearby.